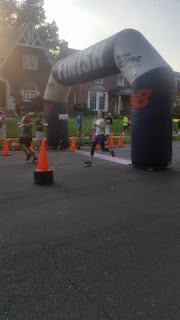 I received notice that finish line photos from my recent 5k were available for viewing. Knowing that such photos of me always fail to impress, I clicked the link with low expectations. What I found has left me giggling throughout the day. The organizers included a caveat that photos were tied to race finishing time, so the photos linked to my bib might include others who finished with the same overall time. Ok, no big deal. Kudos on a great race, sir. you can't see my I-might-puke face. Needless to say, I won't be purchasing any finish line photos from this event. What was your best race photo? Have you ever snagged a good one? Isn't that the truth? In my head, I'm all grace and clean lines. In reality, I'm all goofy faces. Good thing there are no style points in running ;) Thanks for stopping by! I've yet to buy a race photo - they leave a lot to be desired :) Luckily my husband has caught a couple of good ones over the years. Haha! So glad he's been able to snag a few good ones. We spend so much time running, it's nice to have photo evidence of our work! Thanks for stopping by! I'm a 30-something mother runner from St. Louis. I hope to share my journey as a runner, wife, mother, and everything in between. All content property of mama kate runs. Picture Window theme. Powered by Blogger.